Yo rele tranblemanntè oswa goudougoudou oswa seyism yon fenomèn fizik ki rive lè latè pran tranble. Tranblemanntè se vibrasyon ki pwodui lè wòch yo sou yon fay. Gen echèl entènasyonal ki ap mezire fòs yon tranblemanntè. Yonn nan echèl sa yo rele echèl valè MMS. 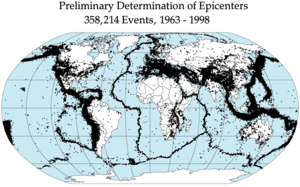 « Earthquake Magnitudes and the Gutenberg-Richter Law ». SimScience. Retrieved 2006-08-14. Hiroo Kanamori, Emily E. Brodsky (2001). « The Physics of Earthquakes ». Physics Today 54 (6): 34. doi:10.1063/1.1387590. Paj sa edite a 17:44, 23 mas 2016.